Here’s another taste of our trip out to Grand Teton National Park and Yellowstone National Park. 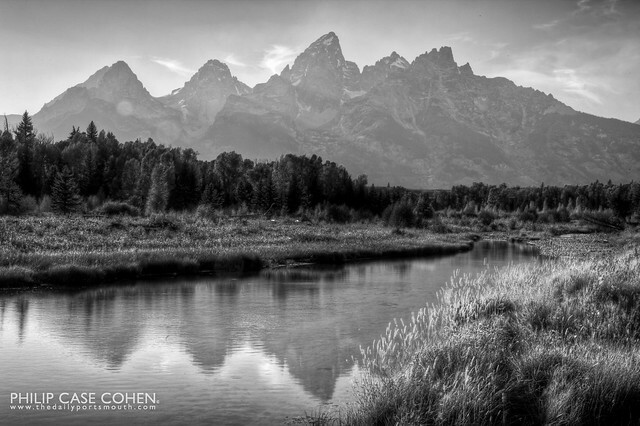 This was taken en route to Schwabacher’s Landing, although we didn’t end up having enough time to venture all the way to the landing itself…so I had to make do with this landscape (which did the trick). I went with a black & white processing as the late afternoon colors were pretty harsh, but the black and white seemed to get the essence of the scene without over distracting colors. Have a great weekend! Man, the Tetons are awesome, aren’t they? We’ve only been back three weeks and I can’t wait to go again. Way to make use of the available light.